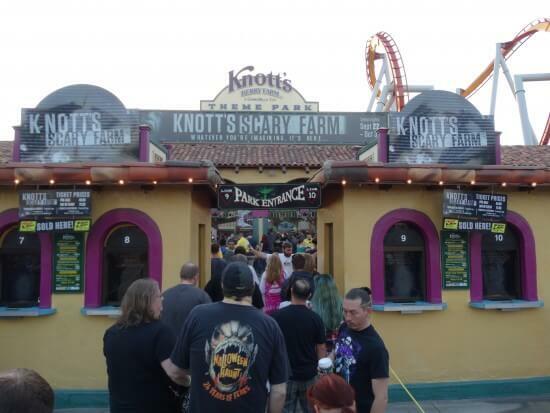 A couple weeks ago, when I attended opening night of Universal Studios Hollywood’s Halloween Horror Nights, I left the event having enjoyed myself but wondering why so many people preferred the overcrowded, awkwardly-laid-out HHN to my personal favorite Southern California Halloween theme park makeover, Knott’s Scary Farm. Scary Farm started in 1973 in the Beuna Park, California-located Knott’s Berry Farm, Orange County’s somewhat more quaint alternative to Disneyland, and since then the season event has grown exponentially and the Halloween season eventually became the Knott’s most well-attended period every year, by far. 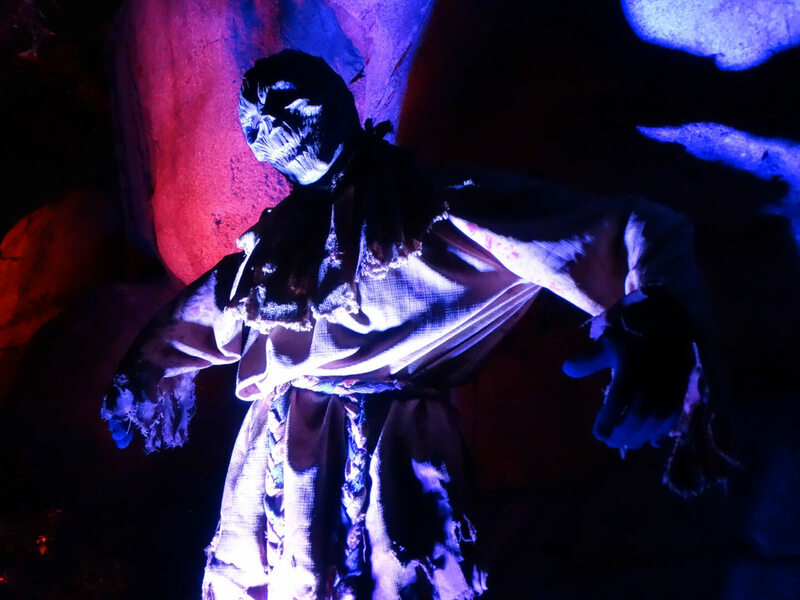 During Scary Farm, the entire park is transformed from a generally family-friendly year-round amusement source to an intricately-decorated atmospherically-spooky creep-fest that fully immerses guests into a truly haunting experience. As with most Halloween overlay-type events such as this, the main attractions at Knott’s Scary Farm are the mazes. This year Knott’s features six returning mazes (Trick or Treat, Voodoo, Paranormal Inc., The Tooth Fairy, The Red Barn, The Dead of Winter, and The Gunslinger’s Grave,) one updated interactive maze experience (Special Ops: Infected,) and two brand-new mazes (Shadow Lands and The Red Barn.) Let’s take a look at the two all-new ones. Shadow Lands draws heavily from a Japanese samurai theme, and incorporate many incredibly impressive effects that I haven’t seen very often mazes like this, including beheadings and some nifty acrobatic wire-work. The overall presentation is more visually impressive than outright scary, but that doesn’t make Shadow Lands any less of a must-see. 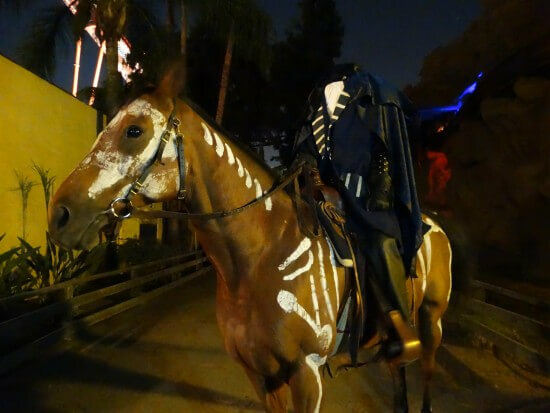 One of the other cool new attractions at this year’s Scary Farm is “The Hollow” scare zone, featuring characters and locales inspired by the classic story “The Legend of Sleepy Hollow,” including the Headless Horseman, represented here by an imposing scare actor on a real horse. The lighting in The Hollow is a little too dark to make for a great video, but I put one together anyway to give you a general sense of what the area feels like. It’s a gloomy, shadowy pathway in the park’s bottom right corner, the perfect place to hang out or stroll through at your leisure for some extra scares. Be sure to visit the other three returning scare zones (Ghost Town, Fiesta de los Muertos, and CarnEvil) as well. The only disappointing element of Knott’s Scary Farm (to me) is its live shows, but I feel that way about Universal’s Halloween celebration as well. I realize she has her following, but I’ve never been a huge fan of Elvira, Mistress of the Dark (whose variety revue Danse Macabre plays nightly at the Charles M. Schulz Theater) and Knott’s centerpiece performance The Hanging relies too heavily on a seemingly-random assortment of pop-culture references, and not enough on laughs. Despite the fact that I wish they’d hire some actual comedy writers to work on The Hanging, I find there’s plenty to do elsewhere in the park and the overall Knott’s experience doesn’t suffer from including live shows that mostly do not interest me. 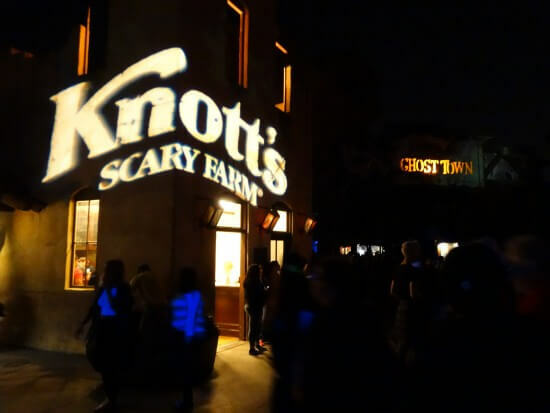 The bottom line is that Knott’s atmosphere, scares, rides, and well-executed mazes make for a consistently and thoroughly enjoyable Halloween theme park experience. If you have the time and money to do multiple high-profile Halloween events in the Los Angeles area, Horror Nights, Mickey’s Halloween Party, and even Six Flags Fright Fest are all worth seeing. But if you have time and budget constraints that limit you to one event only, my recommendation would definitely be to attend Knott’s. Knott’s Scary Farm runs Thursday through Sunday from now until the end of October and Monday, October 31st for Halloween. Visit the official Knott’s Berry Farm website for tickets and more information.